We are happy to announce that we will be participating for our 15th year in the "Give kids a smile" movement. On Feb, Friday, 1st, 2019, we will be providing free dental services to those who need it and may very well not have insurance. 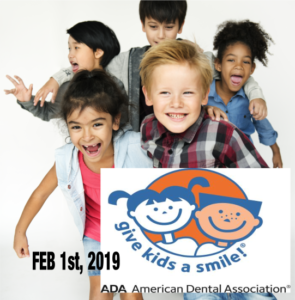 With the support of the ADA Foundation’s Give Kids A Smile program, launched nationally by the American Dental Association in 2003, more than five million underserved children have received free oral health services over the last 13 years. These free services are provided by approximately 10,000 dentists annually, along with 30,000 other dental team members. or call to schedule. Phone numbers can be found at the header of our website next to your desired location. For those who have questions about dental health, dental problems, kids dentistry, braces, and treatment and need to schedule consistent visits with a dentist in the North Jersey area, give us a call at one of our locations nearest you.